For other uses, see Ediacara. The Ediacaran (/ˌiːdiˈækərən/; formerly Vendian) biota consisted of enigmatic tubular and frond-shaped, mostly sessile organisms that lived during the Ediacaran Period (ca. 635–542 Mya). Trace fossils of these organisms have been found worldwide, and represent the earliest known complex multicellular organisms. [note 1] The Ediacaran biota may have radiated in a proposed event called the Avalon explosion, 575 million years ago, after the Earth had thawed from the Cryogenian period's extensive glaciation. The biota largely disappeared with the rapid increase in biodiversity known as the Cambrian explosion. Most of the currently existing body plans of animals first appeared in the fossil record of the Cambrian rather than the Ediacaran. For macroorganisms, the Cambrian biota appears to have completely replaced the organisms that dominated the Ediacaran fossil record, although relationships are still a matter of debate. The organisms of the Ediacaran Period first appeared around 600 million years ago and flourished until the cusp of the Cambrian 542 million years ago, when the characteristic communities of fossils vanished. A diverse Ediacaran community was discovered in 1995 in Sonora, Mexico, and is approximately 555 million years in age, roughly coeval with Ediacaran fossils of the Ediacara Hills, South Australia and the White Sea, Russia. While rare fossils that may represent survivors have been found as late as the Middle Cambrian (510 to 500 million years ago), the earlier fossil communities disappear from the record at the end of the Ediacaran leaving only curious fragments of once-thriving ecosystems. Multiple hypotheses exist to explain the disappearance of this biota, including preservation bias, a changing environment, the advent of predators and competition from other life-forms. 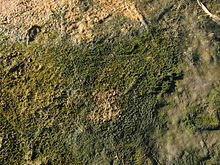 Determining where Ediacaran organisms fit in the tree of life has proven challenging; it is not even established that they were animals, with suggestions that they were lichens (fungus-alga symbionts), algae, protists known as foraminifera, fungi or microbial colonies, or hypothetical intermediates between plants and animals. The morphology and habit of some taxa (e.g. Funisia dorothea) suggest relationships to Porifera or Cnidaria. Kimberella may show a similarity to molluscs, and other organisms have been thought to possess bilateral symmetry, although this is controversial. Most macroscopic fossils are morphologically distinct from later life-forms: they resemble discs, tubes, mud-filled bags or quilted mattresses. Due to the difficulty of deducing evolutionary relationships among these organisms, some palaeontologists have suggested that these represent completely extinct lineages that do not resemble any living organism. One palaeontologist proposed a separate kingdom level category Vendozoa (now renamed Vendobionta) in the Linnaean hierarchy for the Ediacaran biota. If these enigmatic organisms left no descendants, their strange forms might be seen as a "failed experiment" in multicellular life, with later multicellular life evolving independently from unrelated single-celled organisms. However, a 2018 study confirmed that one of the period's most-prominent and iconic fossils, Dickinsonia, included cholesterol, limiting its affinities to that of animals. The concept of "Ediacaran Biota" is somewhat artificial as it can not be defined geographically, stratigraphically, taphonomically, or biologically. The first Ediacaran fossils discovered were the disc-shaped Aspidella terranovica in 1868. Their discoverer, Scottish geologist Alexander Murray, found them useful aids for correlating the age of rocks around Newfoundland. However, since they lay below the "Primordial Strata" of the Cambrian that was then thought to contain the very first signs of animal life, a proposal four years after their discovery by Elkanah Billings that these simple forms represented fauna was dismissed by his peers. Instead, they were interpreted as gas escape structures or inorganic concretions. No similar structures elsewhere in the world were then known and the one-sided debate soon fell into obscurity. In 1933, Georg Gürich discovered specimens in Namibia but the firm belief that complex life originated in the Cambrian led to them being assigned to the Cambrian Period and no link to Aspidella was made. In 1946, Reg Sprigg noticed "jellyfishes" in the Ediacara Hills of Australia's Flinders Ranges but these rocks were believed to be Early Cambrian so, while the discovery sparked some interest, little serious attention was garnered. It was not until the British discovery of the iconic Charnia that the pre-Cambrian was seriously considered as containing life. This frond-shaped fossil was found in England's Charnwood Forest first by a 15-year-old girl in 1956 (who was not believed) and then the next year by a group of three schoolboys including 15-year-old Roger Mason and due to the detailed geological mapping of the British Geological Survey there was no doubt these fossils sat in Precambrian rocks. Palaeontologist Martin Glaessner finally, in 1959, made the connection between this and the earlier finds and with a combination of improved dating of existing specimens and an injection of vigour into the search many more instances were recognised. All specimens discovered until 1967 were in coarse-grained sandstone that prevented preservation of fine details, making interpretation difficult. S.B. Misra's discovery of fossiliferous ash-beds at the Mistaken Point assemblage in Newfoundland changed all this as the delicate detail preserved by the fine ash allowed the description of features that were previously undiscernible. It was also the first discovery of Ediacarans in deep water sediments. Poor communication, combined with the difficulty in correlating globally distinct formations, led to a plethora of different names for the biota. In 1960 the French name "Ediacarien" – after the Ediacara Hills – was added to the competing terms "Sinian" and "Vendian" for terminal-Precambrian rocks, and these names were also applied to the life-forms. "Ediacaran" and "Ediacarian" were subsequently applied to the epoch or period of geological time and its corresponding rocks. In March 2004, the International Union of Geological Sciences ended the inconsistency by formally naming the terminal period of the Neoproterozoic after the Australian locality. The term "Ediacaran biota" and similar ("Ediacara"/"Ediacaran"/"Ediacarian"/"Vendian", "fauna"/"biota") has, at various times, been used in a geographic, stratigraphic, taphonomic, or biological sense, with the latter the most common in modern literature. Microbial mats are areas of sediment stabilised by the presence of colonies of microbes that secrete sticky fluids or otherwise bind the sediment particles. They appear to migrate upwards when covered by a thin layer of sediment but this is an illusion caused by the colony's growth; individuals do not, themselves, move. If too thick a layer of sediment is deposited before they can grow or reproduce through it, parts of the colony will die leaving behind fossils with a characteristically wrinkled ("elephant skin") and tubercular texture. Some Ediacaran strata with the texture characteristics of microbial mats contain fossils, and Ediacaran fossils are almost always found in beds that contain these microbial mats. Although microbial mats were once widespread, the evolution of grazing organisms in the Cambrian vastly reduced their numbers. These communities are now limited to inhospitable refugia, such as the stromatolites found in Hamelin Pool Marine Nature Reserve in Shark Bay, Western Australia where the salt levels can be twice those of the surrounding sea. The fossil Charniodiscus is barely distinguishable from the "elephant skin" texture on this cast. The preservation of these fossils is one of their great fascinations to science. As soft-bodied organisms, they would normally not fossilize and, unlike later soft-bodied fossil biota such as the Burgess Shale or Solnhofen Limestone, the Ediacaran biota is not found in a restricted environment subject to unusual local conditions: they were a global phenomenon. The processes that were operating must have been systemic and worldwide. There was something very different about the Ediacaran Period that permitted these delicate creatures to be left behind and it is thought the fossils were preserved by virtue of rapid covering by ash or sand, trapping them against the mud or microbial mats on which they lived. Their preservation was possibly enhanced by the high concentration of silica in the oceans before silica-secreting organisms such as sponges and diatoms became prevalent. Ash beds provide more detail and can readily be dated to the nearest million years or better using radiometric dating. However, it is more common to find Ediacaran fossils under sandy beds deposited by storms or high-energy bottom-scraping ocean currents known as turbidites. Soft-bodied organisms today rarely fossilize during such events, but the presence of widespread microbial mats probably aided preservation by stabilising their impressions in the sediment below. The rate of cementation of the overlying substrate relative to the rate of decomposition of the organism determines whether the top or bottom surface of an organism is preserved. Most disc-shaped fossils decomposed before the overlying sediment was cemented, whereupon ash or sand slumped in to fill the void, leaving a cast of the organism's underside. Conversely, quilted fossils tended to decompose after the cementation of the overlying sediment; hence their upper surfaces are preserved. Their more resistant nature is reflected in the fact that, in rare occasions, quilted fossils are found within storm beds as the high-energy sedimentation did not destroy them as it would have the less-resistant discs. Further, in some cases, the bacterial precipitation of minerals formed a "death mask", ultimately leaving a positive, cast-like impression of the organism. The earliest discovered potential embryo, preserved within an acanthomorphic acritarch. The term 'acritarch' describes a range of unclassified cell-like fossils. Tateana inflata (= 'Cyclomedusa' radiata) is the attachment disk of an unknown organism. A cast of the quilted Charnia, the first accepted complex Precambrian organism. Charnia was once interpreted as a relative of the sea pens. Spriggina was originally interpreted as annelid or arthropod. However, lack of known limbs, and glide reflected isomers instead of true segments, rejects any such classification despite some superficial resemblance. Late Ediacaran Archaeonassa-type trace fossils are commonly preserved on the top surfaces of sandstone strata. 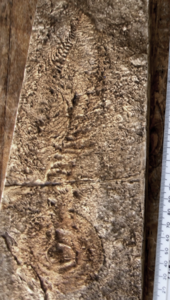 Epibaion waggoneris, chain of trace platforms and the imprint of the body of Yorgia waggoneri (right), which created these traces on microbial mat. The Ediacaran biota exhibited a vast range of morphological characteristics. Size ranged from millimetres to metres; complexity from "blob-like" to intricate; rigidity from sturdy and resistant to jelly-soft. Almost all forms of symmetry were present. These organisms differed from earlier fossils by displaying an organised, differentiated multicellular construction and centimetre-plus sizes. Recent discoveries of Precambrian multicellular life have been dominated by reports of embryos, particularly from the Doushantuo Formation in China. Some finds generated intense media excitement though some have claimed they are instead inorganic structures formed by the precipitation of minerals on the inside of a hole. Other "embryos" have been interpreted as the remains of the giant sulfur-reducing bacteria akin to Thiomargarita, a view that, while it had enjoyed a notable gain of supporters as of 2007, has since suffered following further research comparing the potential Doushantuo embryos' morphologies with those of Thiomargarita specimens, both living and in various stages of decay. Microfossils dating from 632.5 million years ago – just 3 million years after the end of the Cryogenian glaciations – may represent embryonic 'resting stages' in the life cycle of the earliest known animals. An alternative proposal is that these structures represent adult stages of the multicellular organisms of this period. Circular fossils, such as Ediacaria, Cyclomedusa and Rugoconites led to the initial identification of Ediacaran fossils as cnidaria, which include jellyfish and corals. Further examination has provided alternative interpretations of all disc-shaped fossils: not one is now confidently recognised as a jellyfish. Alternate explanations include holdfasts and protists; the patterns displayed where two meet have led to many 'individuals' being identified as microbial colonies, and yet others may represent scratch marks formed as stalked organisms spun around their holdfasts. Useful diagnostic characters are often lacking because only the underside of the organism is preserved by fossilisation. Fossils such as Pteridinium preserved within sediment layers resemble "mud-filled bags". The scientific community is a long way from reaching a consensus on their interpretation. The fossil Vendoglossa tuberculata from the Nama Group, Namibia, has been interpreted as a dorso-ventrally compressed stem-group metazoan, with a large gut cavity and a transversely ridged ectoderm. The organism is in the shape of a flattened torus, with the long axis of its toroidal body running through the approximate center of the presumed gut cavity. The organisms considered in Seilacher's revised definition of the Vendobionta share a "quilted" appearance and resembled an inflatable mattress. Sometimes these quilts would be torn or ruptured prior to preservation: such damaged specimens provide valuable clues in the reconstruction process. For example, the three (or more) petaloid fronds of Swartpuntia germsi could only be recognised in a posthumously damaged specimen – usually multiple fronds were hidden as burial squashed the organisms flat. These organisms appear to form two groups: the fractal rangeomorphs and the simpler erniettomorphs. Including such fossils as the iconic Charnia and Swartpuntia, the group is both the most iconic of the Ediacaran biota and the most difficult to place within the existing tree of life. Lacking any mouth, gut, reproductive organs, or indeed any evidence of internal anatomy, their lifestyle was somewhat peculiar by modern standards; the most widely accepted hypothesis holds that they sucked nutrients out of the surrounding seawater by osmotrophy or osmosis. However, others argue against this. Some Ediacaran organisms have more complex details preserved, which has allowed them to be interpreted as possible early forms of living phyla excluding them from some definitions of the Ediacaran biota. The earliest such fossil is the reputed bilaterian Vernanimalcula claimed by some, however, to represent the infilling of an egg-sac or acritarch. Later examples are almost universally accepted as bilaterians and include the mollusc-like Kimberella, Spriggina (pictured) and the shield-shaped Parvancorina whose affinities are currently debated. A suite of fossils known as the Small shelly fossils are represented in the Ediacaran, most famously by Cloudina a shelly tube-like fossil that often shows evidence of predatory boring, suggesting that, while predation may not have been common in the Ediacaran Period, it was at least present. Representatives of modern taxa existed in the Ediacaran, some of which are recognisable today. Sponges, red and green algæ, protists and bacteria are all easily recognisable with some pre-dating the Ediacaran by nearly three billion years. Possible arthropods have also been described. With the exception of some very simple vertical burrows the only Ediacaran burrows are horizontal, lying on or just below the surface of the seafloor. Such burrows have been taken to imply the presence of motile organisms with heads, which would probably have had a bilateral symmetry. This could place them in the bilateral clade of animals but they could also have been made by simpler organisms feeding as they slowly rolled along the sea floor. Putative "burrows" dating as far back as 1,100 million years may have been made by animals that fed on the undersides of microbial mats, which would have shielded them from a chemically unpleasant ocean; however their uneven width and tapering ends make a biological origin so difficult to defend that even the original proponent no longer believes they are authentic. The burrows observed imply simple behaviour, and the complex efficient feeding traces common from the start of the Cambrian are absent. Some Ediacaran fossils, especially discs, have been interpreted tentatively as trace fossils but this hypothesis has not gained widespread acceptance. As well as burrows, some trace fossils have been found directly associated with an Ediacaran fossil. Yorgia and Dickinsonia are often found at the end of long pathways of trace fossils matching their shape; these fossils are thought to be associated with ciliary feeding but the precise method of formation of these disconnected and overlapping fossils largely remains a mystery. The potential mollusc Kimberella is associated with scratch marks, perhaps formed by a radula. Classification of the Ediacarans is difficult, and hence a variety of theories exist as to their placement on the tree of life. Martin Glaessner proposed in The Dawn of Animal Life (1984) that the Ediacaran biota were recognizable crown group members of modern phyla, but were unfamiliar because they had yet to evolve the characteristic features we use in modern classification. In 1998 Mark McMenamin claimed Ediacarans did not possess an embryonic stage, and thus could not be animals. He believed that they independently evolved a nervous system and brains, meaning that "the path toward intelligent life was embarked upon more than once on this planet". In 2018 analysis of ancient sterols was taken as evidence that one of the period's most-prominent and iconic fossils, Dickinsonia, was an early animal., but cholesterol also is known in Glomeromycota fungi . Since the most primitive eumetazoans—multi-cellular animals with tissues—are cnidarians, the first attempt to categorise these fossils designated them as jellyfish and sea pens. However, more recent discoveries have established that many of the circular forms formerly considered "cnidarian medusa" are actually holdfasts – sand-filled vesicles occurring at the base of the stem of upright frond-like Ediacarans. A notable example is the form known as Charniodiscus, a circular impression later found to be attached to the long 'stem' of a frond-like organism that now bears the name. The link between certain frond-like Ediacarans and sea pens has been thrown into doubt by multiple lines of evidence; chiefly the derived nature of the most frond-like pennatulacean octocorals, their absence from the fossil record before the Tertiary, and the apparent cohesion between segments in Ediacaran frond-like organisms. Some researchers have suggested that an analysis of "growth poles" discredits the pennatulacean nature of Ediacaran fronds. Adolf Seilacher has suggested the Ediacaran sees animals usurping giant protists as the dominant life form. The modern xenophyophores are giant single-celled protozoans found throughout the world's oceans, largely on the abyssal plain. A recent genetic study suggested that the xenophyophores are a specialised group of Foraminifera. There are approximately 42 recognised species in 13 genera and 2 orders; one of which, Syringammina fragilissima, is among the largest known protozoans at up to 20 centimetres in diameter. Seilacher has suggested that the Ediacaran organisms represented a unique and extinct grouping of related forms descended from a common ancestor (clade) and created the kingdom Vendozoa, named after the now-obsolete Vendian era. He later excluded fossils identified as metazoans and relaunched the phylum "Vendobionta". He described the Vendobionta as quilted cnidarians lacking stinging cells. This absence precludes the current cnidarian method of feeding, so Seilacher suggested that the organisms may have survived by symbiosis with photosynthetic or chemoautotrophic organisms. Mark McMenamin saw such feeding strategies as characteristic for the entire biota, and referred to the marine biota of this period as a "Garden of Ediacara". Greg Retallack's hypothesis that Ediacaran organisms were lichens has been controversial. He argues that the fossils are not as squashed as known fossil jellyfish, and their relief is closer to compressed woody branches whose compaction can be estimated as compressed cylinders. He points out the chitinous walls of lichen colonies would provide a similar resistance to compaction, and claims the large size of the organisms (up to 1.5 metres long, far larger than any of the preserved burrows) also hints against classification with animals. Thin sections of Ediacaran fossils show lichen-like compartments and hypha-like wisps of ferruginized clay. Finally, Ediacaran fossils from classic localities of the Flinders Ranges have been found in growth position within red calcareous and gypsiferous paleosols, interpreted as well-drained temperate desert soils. Such habitats limit interpretive options for fractal Ediacaran fossils such as Dickinsonia to lichenised or unlichenised fungi, but other Ediacaran fossils could have been slime moulds or microbial colonies. Several classifications have been used to accommodate the Ediacaran biota at some point, from algae, to protozoans, to fungi to bacterial or microbial colonies, to hypothetical intermediates between plants and animals. A new extant genus discovered in 2014, Dendrogramma, which appears to be a basal metazoan but of unknown taxonomic placement, has been noted to have similarities with the Ediacaran fauna. It has since been found to be a siphonophore, possibly even sections of a more complex species, though this in turn has raised suspicions for a similar status for at least some ediacaran organisms. It took almost 4 billion years from the formation of the Earth for the Ediacaran fossils to first appear, 655 million years ago. 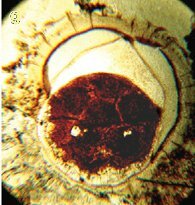 While putative fossils are reported from 3,460 million years ago, the first uncontroversial evidence for life is found 2,700 million years ago, and cells with nuclei certainly existed by 1,200 million years ago: The reason why it took so long for forms with an Ediacaran grade of organisation to appear is uncertain. It could be that no special explanation is required: the slow process of evolution simply required 4 billion years to accumulate the necessary adaptations. Indeed, there does seem to be a slow increase in the maximum level of complexity seen over this time, with more and more complex forms of life evolving as time progresses, with traces of earlier semi-complex life such as Nimbia, found in the 610 million year old Twitya formation, (and possibly older rocks dating to 770 million years ago) possibly displaying the most complex morphology of the time. Global ice sheets may have delayed or prevented the establishment of multicellular life. The alternative train of thought is that it was simply not advantageous to be large until the appearance of the Ediacarans: the environment favoured the small over the large. Examples of such scenarios today include plankton, whose small size allows them to reproduce rapidly to take advantage of ephemerally abundant nutrients in algal blooms. But for large size never to be favourable, the environment would have to be very different indeed. A primary size-limiting factor is the amount of atmospheric oxygen. Without a complex circulatory system, low concentrations of oxygen cannot reach the centre of an organism quickly enough to supply its metabolic demand. On the early Earth, reactive elements, such as iron and uranium, existed in a reduced form that would react with any free oxygen produced by photosynthesising organisms. Oxygen would not be able to build up in the atmosphere until all the iron had rusted (producing banded iron formations), and all the other reactive elements had been oxidised. Donald Canfield detected records of the first significant quantities of atmospheric oxygen just before the first Ediacaran fossils appeared – and the presence of atmospheric oxygen was soon heralded as a possible trigger for the Ediacaran radiation. Oxygen seems to have accumulated in two pulses; the rise of small, sessile (stationary) organisms seems to correlate with an early oxygenation event, with larger and mobile organisms appearing around the second pulse of oxygenation. However, the assumptions underlying the reconstruction of atmospheric composition have attracted some criticism, with widespread anoxia having little effect on life where it occurs in the Early Cambrian and the Cretaceous. Periods of intense cold have also been suggested as a barrier to the evolution of multicellular life. The earliest known embryos, from China's Doushantuo Formation, appear just a million years after the Earth emerged from a global glaciation, suggesting that ice cover and cold oceans may have prevented the emergence of multicellular life. Potentially, complex life may have evolved before these glaciations, and been wiped out. 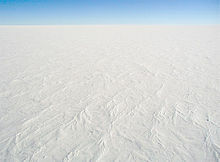 However, the diversity of life in modern Antarctica has sparked disagreement over whether cold temperatures increase or decrease the rate of evolution. In early 2008 a team analysed the range of basic body structures ("disparity") of Ediacaran organisms from three different fossil beds: Avalon in Canada, 575 to 565 million years ago; White Sea in Russia, 560 to 550 million years ago; and Nama in Namibia, 550 to 542 million years ago, immediately before the start of the Cambrian. They found that, while the White Sea assemblage had the most species, there was no significant difference in disparity between the three groups, and concluded that before the beginning of the Avalon timespan these organisms must have gone through their own evolutionary "explosion", which may have been similar to the famous Cambrian explosion . The paucity of Ediacaran fossils after the Cambrian could simply be due to conditions that no longer favoured the fossilisation of Ediacaran organisms, which may have continued to thrive unpreserved. However, if they were common, more than the occasional specimen might be expected in exceptionally preserved fossil assemblages (Konservat-Lagerstätten) such as the Burgess Shale and Chengjiang. There are at present no widely accepted reports of Ediacara-type organisms in the Cambrian period, though there are a few disputed reports, as well as unpublished observations of 'vendobiont' fossils from 535 Ma Orsten-type deposits in China. Kimberella may have had a predatory or grazing lifestyle. It is suggested that by the Early Cambrian, organisms higher in the food chain caused the microbial mats to largely disappear. If these grazers first appeared as the Ediacaran biota started to decline, then it may suggest that they destabilised the microbial substrate, leading to displacement or detachment of the biota; or that the destruction of the mat destabilised the ecosystem, causing extinctions. Alternatively, skeletonised animals could have fed directly on the relatively undefended Ediacaran biota. However, if the interpretation of the Ediacaran age Kimberella as a grazer is correct then this suggests that the biota had already had limited exposure to "predation". There is however little evidence for any trace fossils in the Ediacaran Period, which may speak against the active grazing theory. Further, the onset of the Cambrian Period is defined by the appearance of a worldwide trace fossil assemblage, quite distinct from the activity-barren Ediacaran Period. Cambrian animals such as Waptia may have competed with, or fed upon, Ediacaran life-forms. It is possible that increased competition due to the evolution of key innovations among other groups, perhaps as a response to predation, drove the Ediacaran biota from their niches. However, this argument has not successfully explained similar phenomena. For instance, the bivalve molluscs' "competitive exclusion" of brachiopods was eventually deemed to be a coincidental result of two unrelated trends. While it is difficult to infer the effect of changing planetary conditions on organisms, communities and ecosystems, great changes were happening at the end of the Precambrian and the start of the Early Cambrian. The breakup of the supercontinents, rising sea levels (creating shallow, "life-friendly" seas), a nutrient crisis, fluctuations in atmospheric composition, including oxygen and carbon dioxide levels, and changes in ocean chemistry (promoting biomineralisation) could all have played a part. Ediacaran-type fossils are recognised globally in 25 localities and a variety of depositional conditions, and are commonly grouped into three main types, known as assemblages and named after typical localities. Each assemblage tends to occupy its own region of morphospace, and after an initial burst of diversification changes little for the rest of its existence. The Avalon-type assemblage is defined at Mistaken Point in Canada, the oldest locality with a large quantity of Ediacaran fossils. The assemblage is easily dated because it contains many fine ash-beds, which are a good source of zircons used in the uranium-lead method of radiometric dating. These fine-grained ash beds also preserve exquisite detail. Constituents of this biota appear to survive through until the extinction of all Ediacarans at the base of the Cambrian. One interpretation of the biota is as deep-sea-dwelling rangeomorphs such as Charnia, all of which share a fractal growth pattern. They were probably preserved in situ (without post-mortem transportation), although this point is not universally accepted. The assemblage, while less diverse than the Ediacara- or Nama-types, resembles Carboniferous suspension-feeding communities, which may suggest filter feeding – by most interpretations, the assemblage is found in water too deep for photosynthesis. The low diversity may reflect the depth of water – which would restrict speciation opportunities – or it may just be too young for a rich biota to have evolved. Opinion is currently divided between these conflicting hypotheses. An alternative explanation for the distinct composition of the Avalon-type assemblage is that it was a terrestrial assemblage of volcaniclastic coastal soils near a continental volcanic arc . This view is based on geochemical studies of the substrates of Mistaken Point fossils and associated matrix supported tuffs and volcanic bombs that could only form on land . Some of these fossils such as Fractofusus and Charniodiscus were found in red well drained paleosols of coastal plains, but others such as Aspidella were found in pyritic intertidal paleosols. The Ediacara-type assemblage is named after Australia's Ediacara Hills, and consists of fossils preserved in facies of coastal lagoons and rivers. They are typically found in red gypsiferous and calcareous paleosols formed on loess and flood deposits in an arid cool temperate paleoclimate. Most fossils are preserved as imprints in microbial earths, but a few are preserved within sandy units. The Nama assemblage is best represented in Namibia. Three-dimensional preservation is most common, with organisms preserved in sandy beds containing internal bedding. Dima Grazhdankin believes that these fossils represent burrowing organisms, while Guy Narbonne maintains they were surface dwellers. These beds are sandwiched between units comprising interbedded sandstones, siltstones and shales – with microbial mats, where present, usually containing the fossils. The environment is interpreted as sand bars formed at the mouth of a delta's distributaries. Mattress-like vendobionts (Ernietta, Pteridinium, Rangea) in these sandstones form a very different assemblage from vermiform fossils (Cloudina, Namacalathus) of Ediacaran "wormworld" in marine dolostones of Namibia . In the White Sea region of Russia, all three assemblage types have been found in close proximity. This, and the faunas' considerable temporal overlap, makes it unlikely that they represent evolutionary stages or temporally distinct communities. Since they are globally distributed – described on all continents except Antarctica – geographical boundaries do not appear to be a factor; the same fossils are found at all palaeolatitudes (the latitude where the fossil was created, accounting for continental drift) and in separate sedimentary basins. It is most likely that the three assemblages mark organisms adapted to survival in different environments, and that any apparent patterns in diversity or age are in fact an artefact of the few samples that have been discovered – the timeline (right) demonstrates the paucity of Ediacaran fossil-bearing assemblages. An analysis of one of the White Sea fossil beds, where the layers cycle from continental seabed to inter-tidal to estuarine and back again a few times, found that a specific set of Ediacaran organisms was associated with each environment. As the Ediacaran biota represent an early stage in multicellular life's history, it is unsurprising that not all possible modes of life are occupied. It has been estimated that of 92 potentially possible modes of life – combinations of feeding style, tiering and motility — no more than a dozen are occupied by the end of the Ediacaran. Just four are represented in the Avalon assemblage. The lack of large-scale predation and vertical burrowing are perhaps the most significant factors limiting the ecological diversity; the emergence of these during the Early Cambrian allowed the number of lifestyles occupied to rise to 30. ^ Simple multicellular organisms such as red algae evolved at least 1,200 million years ago. The status of the Francevillian biota of 2,100 million years ago is unclear, but they may represent earlier multicellular forms of a more complex nature. ^ McMenamin, M. A. S. (1996). "Ediacaran biota from Sonora, Mexico". Proceedings of the National Academy of Sciences of the United States of America. 93 (10): 4990–4993. Bibcode:1996PNAS...93.4990M. doi:10.1073/pnas.93.10.4990. PMC 39393. PMID 11607679. ^ McMenamin, M. A. S. (2018). Deep Time Analysis: A Coherent View of the History of Life. Cham, Switzerland: Springer Geology. ISBN 978-3-319-74255-7. ^ Narbonne, Guy (2008). 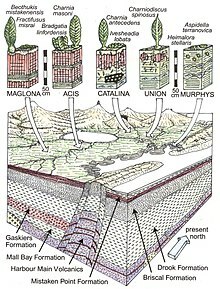 "The Gaskiers glaciation as a significant divide in Ediacaran history and stratigraphy". 2008 International Geological Congress. ^ a b Conway Morris, S. (1993). "Ediacaran-like fossils in Cambrian Burgess Shale–type faunas of North America". Palaeontology. 36 (31–0239): 593–635. ^ a b Pflug (1973). "Zur fauna der Nama-Schichten in Südwest-Afrika. IV. Mikroscopische anatomie der petalo-organisme". Paleontographica (in German) (B144): 166–202. ^ Droser, ML; Gehling, J. G. (2008). "Synchronous Aggregate Growth in an Abundant New Ediacaran Tubular Organism". Science. 319 (5870): 1660–1662. Bibcode:2008Sci...319.1660D. doi:10.1126/science.1152595. PMID 18356525. ^ a b Seilacher, A. (1992). "Vendobionta and Psammocorallia: lost constructions of Precambrian evolution". Journal of the Geological Society, London. 149 (4): 607–613. Bibcode:1992JGSoc.149..607S. doi:10.1144/gsjgs.149.4.0607. ^ Narbonne, Guy (June 2006). "The Origin and Early Evolution of Animals". Department of Geological Sciences and Geological Engineering, Queen's University. Archived from the original on 2015-07-24. Retrieved 2016-09-08. ^ a b Bobrovskiy, Ilya; Hope, Janet M.; Ivantsov, Andrey; Nettersheim, Benjamin J.; Hallmann, Christian; Brocks, Jochen J. (2018-09-21). "Ancient steroids establish the Ediacaran fossil Dickinsonia as one of the earliest animals". Science. 361 (6408): 1246–1249. doi:10.1126/science.aat7228. ISSN 0036-8075. PMID 30237355. ^ Waggoner, Ben (1998). "Interpreting the Earliest Metazoan Fossils: What Can We Learn?". Integrative and Comparative Biology. 38 (6): 975–982. doi:10.1093/icb/38.6.975. ISSN 1540-7063. Retrieved 2007-03-08. ^ Hofmann, H.J. ; Narbonne, G.M. ; Aitken, J.D. (1990). "Ediacaran remains from intertillite beds in northwestern Canada". Geology. 18 (12): 1199–1202. doi:10.1130/0091-7613(1990)018<1199:ERFIBI>2.3.CO;2. ^ MacGabhann, Breandán (2013). "There is no such thing as the 'Ediacara Biota'". Geoscience Frontiers. 30: 1–10. ^ a b c Gehling, James G.; Narbonne, Guy M.; Anderson, Michael M. (2000). "The First Named Ediacaran Body Fossil, Aspidella terranovica". Palaeontology. 43 (3): 429. doi:10.1111/j.0031-0239.2000.00134.x. ^ Gürich, G. (1933). "Die Kuibis-Fossilien der Nama-Formation von Südwestafrika". Paläontologische Zeitschrift (in German). 15 (2–3): 137–155. doi:10.1007/bf03041648. ^ a b Sprigg, R. C. (1947). "Early Cambrian "jellyfishes" of Ediacara, South Australia and Mount John, Kimberly District, Western Australia". Transactions of the Royal Society of South Australia. 73: 72–99. ^ "Leicester's fossil celebrity: Charnia and the evolution of early life" (PDF). Retrieved 2007-06-22. ^ Ford, Trevor. "The discovery of Charnia". Archived from the original on 2011-07-23. ^ Negus, Tina. "An account of the discovery of Charnia". Archived from the original on 2011-07-23. ^ Sprigg, R. C. (1991). "Martin F Glaessner: Palaeontologist extraordinaire". Mem. Geol. Soc. India. 20: 13–20. ^ Glaessner, M. F. (1959). "The oldest fossil faunas of South Australia". International Journal of Earth Sciences. 47 (2): 522–531. Bibcode:1959GeoRu..47..522G. doi:10.1007/BF01800671. ^ Glaessner, Martin F. (1961). "Precambrian Animals". Scientific American. 204 (3): 72–78. Bibcode:1961SciAm.204c..72G. doi:10.1038/scientificamerican0361-72. ^ Misra, S. B. (1969). "Late Precambrian(?) fossils from southeastern Newfoundland". Geol. Soc. Am. Bull. 80 (11): 2133–2140. Bibcode:1969GSAB...80.2133M. doi:10.1130/0016-7606(1969)80[2133:LPFFSN]2.0.CO;2. ^ "Mistaken Point Fossil Assemblage". The Miller Museum of Geology, Queen's University, Kingston, Ontario, Canada. Archived from the original on January 15, 2013. ^ Narbonne, G.M (2007). The Rise of Animals. John Hopkins University Press. p. 55. ISBN 978-0-8018-8679-9. ^ Termier, H.; Termier, G. (1960). "L'Ediacarien, premier etage paleontologique". Rev. Gen. Sci. Et Bull. Assoc. Francaise Avan. Sci. (in French). 67 (3–4): 175–192. ^ a b Knoll, Andy H.; Walter, M.; Narbonne, G.; Christie-Blick, N. (2006). "The Ediacaran Period: a new addition to the geologic time scale" (PDF). Lethaia. 39: 13–30. doi:10.1080/00241160500409223. Archived from the original (PDF) on 2007-02-21. Reprint, 2004 original available here  (PDF). ^ a b Runnegar, B. N.; Fedonkin, M. A. (1992). "Proterozoic metazoan body fossils". In Schopf, W. J.; Klein; C. The Proterozoic biosphere. Cambridge University Press. pp. 369–388. ISBN 978-0-521-36615-1. OCLC 23583672. ^ Burzin, M. B.; Debrenne, F.; Zhuravlev, A. Y. (2001). "Evolution of shallow-water level-bottom communities". In Zhuravlev, A. Y.; Riding, R. The Ecology of the Cambrian Radiation. New York: Columbia University Press. pp. 216–237. ISBN 978-0-231-50516-1. OCLC 51852000. ^ Burns, B. P.; Goh, F.; Allen, M.; Neilan, B. A. (2004). "Microbial diversity of extant stromatolites in the hypersaline marine environment of Shark Bay, Australia". Environmental Microbiology. 6 (10): 1096–1101. doi:10.1111/j.1462-2920.2004.00651.x. PMID 15344935. ^ a b c Narbonne, Guy M. (1998). "The Ediacara biota: A terminal Neoproterozoic experiment in the evolution of life" (PDF). GSA. 8 (2): 1–6. ISSN 1052-5173. ^ Tarhan, Lidya G.; Hood, Ashleigh v.S. ; Droser, Mary L.; Gehling, James G.; Briggs, Derek E.G. (2016). "Exceptional preservation of soft-bodied Ediacara Biota promoted by silica-rich oceans". Geology. 44 (11): 951. Bibcode:2016Geo....44..951T. doi:10.1130/G38542.1. ^ Bowring, S. A.; Martin, M. W. (2001). "Calibration of the Fossil Record". In Briggs & Crowther. Palæobiology II: A synthesis. Blackwell publishing group. ISBN 978-0-632-05149-6. OCLC 51481754. Archived from the original on 2007-09-29. Retrieved 2007-06-21. ^ Gehling, J. G. (1987). "Earliest known echinoderm – A new Ediacaran fossil from the Pound Subgroup of South Australia". Alcheringa. 11 (4): 337–345. doi:10.1080/03115518708619143. ^ Gehling, J. G. (1999-02-01). "Microbial mats in terminal Proterozoic siliciclastics; Ediacaran death masks". PALAIOS. 14 (1): 40–57. doi:10.2307/3515360. JSTOR 3515360. (Registration required (help)). ^ Liu, Alexander G. (2016). "Framboidal Pyrite Shroud Confirms the 'Death Mask' Model for Moldic Preservation of Ediacaran Soft-Bodied Organisms" (PDF). PALAIOS. 31 (5): 259–274. Bibcode:2016Palai..31..259L. doi:10.2110/palo.2015.095. hdl:1983/535d288a-68ee-4481-8553-6b7d2e45dacb. ^ Chen, J-Y; Bottjer, DJ; Oliveri, P; Dornbos, SQ; Gao, F; Ruffins, S; Chi, H; Li, CW; Davidson, EH (Jul 2004). "Small Bilaterian Fossils from 40 to 55 Million Years Before the Cambrian". Science. 305 (5681): 218–222. Bibcode:2004Sci...305..218C. doi:10.1126/science.1099213. PMID 15178752. Retrieved 2007-04-27. ^ For example, "Fossil may be ancestor of most animals". MSNBC. Retrieved 2007-06-22. , Leslie Mullen (2004-06-05). "Earliest Bilateral Fossil Discovered". Astrobiology Magazine. Retrieved 2007-06-22. ^ a b Bengtson, S.; Budd, G (19 November 2004). "Comment on "Small Bilaterian Fossils from 40 to 55 Million Years Before the Cambrian"". Science. 306 (5700): 1291. doi:10.1126/science.1101338. PMID 15550644. ^ e.g. Bailey, J. V.; Joye, S. B.; Kalanetra, K. M.; Flood, B. E.; Corsetti, F. A. (Jan 2007). "Evidence of giant sulphur bacteria in Neoproterozoic phosphorites". Nature. 445 (7124): 198–201. Bibcode:2007Natur.445..198B. doi:10.1038/nature05457. PMID 17183268. Retrieved 2007-04-28. , summarised by Donoghue, P. C. J. (Jan 2007). "Embryonic identity crisis". Nature. 445 (7124): 155–156. Bibcode:2007Natur.445..155D. doi:10.1038/nature05520. PMID 17183264. Retrieved 2007-06-21. ^ Cunningham, J. A.; Thomas, C.-W.; Bengtson, S.; Marone, F.; Stampanoni, M.; Turner, F. R.; Bailey, J. V.; Raff, R. A.; Raff, E. C. (2012-05-07). "Experimental taphonomy of giant sulphur bacteria: implications for the interpretation of the embryo-like Ediacaran Doushantuo fossils". Proceedings of the Royal Society of London B: Biological Sciences. 279 (1734): 1857–1864. doi:10.1098/rspb.2011.2064. ISSN 0962-8452. PMC 3297454. PMID 22158954. ^ Leiming, Y.; Zhu, M; Knoll, A; Yuan, X; Zhang, J; Hu, J (2007-04-05). "Doushantuo embryos preserved inside diapause egg cysts". Nature. 446 (7136): 661–663. Bibcode:2007Natur.446..661Y. doi:10.1038/nature05682. PMID 17410174. Retrieved 2007-04-27. ^ a b c McMenamin M. (1998). The Garden of Ediacara. New York: Columbia University Press. ISBN 978-0-231-10559-0. OCLC 228271905. ^ a b Grazhdankin, D. (2001). Microbial origin of some of the Ediacaran fossils. GSA Annual Meeting, November 5–8, 2001. p. 177. Retrieved 2007-03-08. ^ Grazhdankin, D.; Gerdes, G. (2007). "Ediacaran microbial colonies". Lethaia. 40 (3): 201–210. doi:10.1111/j.1502-3931.2007.00025.x. ^ Jensen, S.; Gehling, J. G.; Droser, M. L.; Grant, S. W. F. (2002). "A scratch circle origin for the medusoid fossil Kullingia" (PDF). Lethaia. 35 (4): 291–299. CiteSeerX 10.1.1.535.2625. doi:10.1080/002411602320790616. ^ a b (a) The only current description, far from universal acceptance, appears as: Grazhdankin, D.; Seilacher, A. (2002). "Underground Vendobionta From Namibia". Palaeontology. 45 (1): 57–78. doi:10.1111/1475-4983.00227. ^ McMenamin, M. A. S. (2009). Paleotorus: The Laws of Morphogenetic Evolution. Meanma Press. ISBN 978-1-893882-18-8. ^ Narbonne, Guy M.; Saylor, Beverly Z.; Grotzinger, John P. (1997). "The Youngest Ediacaran Fossils from Southern Africa". Journal of Paleontology. 71 (6): 953–67. JSTOR 1306595. PMID 11541433. (Registration required (help)). ^ Xiao, S.; Laflamme, M. (January 2009). "On the eve of animal radiation: phylogeny, ecology and evolution of the Ediacara biota". Trends in Ecology and Evolution. 24 (1): 31–40. doi:10.1016/j.tree.2008.07.015. PMID 18952316. ^ McMenamin, M. (1993). "Osmotrophy in fossil protoctists and early animals". Invertebrate Reproduction and Development. 22 (1–3): 301–304. ^ Laflamme, M.; Xiao, S.; Kowalewski, M. (2009). "Osmotrophy in modular Ediacara organisms". Proceedings of the National Academy of Sciences. 106 (34): 14438–14443. Bibcode:2009PNAS..10614438L. doi:10.1073/pnas.0904836106. PMC 2732876. PMID 19706530. ^ Liu, Alexander G; Kenchington, Charlotte G; Mitchell, Emily G (2015). "Remarkable insights into the paleoecology of the Avalonian Ediacaran macrobiota". Gondwana Research. 27 (4): 1355–1380. Bibcode:2015GondR..27.1355L. doi:10.1016/j.gr.2014.11.002. ^ Chen, J.-Y. (19 November 2004). "Response to Comment on "Small Bilaterian Fossils from 40 to 55 Million Years Before the Cambrian"". Science. 306 (5700): 1291. doi:10.1126/science.1102328. ^ a b Fedonkin, M. A.; Waggoner, B. M. (Nov 1997). "The Late Precambrian fossil Kimberella is a mollusc-like bilaterian organism". Nature. 388 (6645): 868–871. Bibcode:1997Natur.388..868F. doi:10.1038/42242. Retrieved 2007-03-08. ^ McMenamin, Mark A. S. (2003). Spriggina is a Trilobitoid Ecdysozoan. Seattle Annual Meeting of the GSA. Retrieved 2007-06-21. ^ Glaessner, M. F. (1980). "Parvancorina – an arthropod from the late Precambrian of South Australia". Ann. Nat. Hist. Mus. Wien. 83: 83–90. ^ For a reinterpretation, see Ivantsov, A. Y.; Malakhovskaya, Y. E.; Serezhnikova, E. A. (2004). "Some Problematic Fossils from the Vendian of the Southeastern White Sea Region" (PDF). Paleontological Journal. 38 (1): 1–9. Archived from the original (PDF) on 2007-07-04. Retrieved 2007-06-21. ^ Germs, G. J. B. (October 1972). "New shelly fossils from Nama Group, South West Africa". American Journal of Science. 272 (8): 752–761. Bibcode:1972AmJS..272..752G. doi:10.2475/ajs.272.8.752. ^ Ivantsov A. Yu (2006). "New find of Cambrian type arthropoda from the Vendian of the White Sea, Russia". The Second International Palaeontological Congress, Beijing, China. July 17–21, 2006 (PDF). Archived from the original (PDF) on 2009-02-25. ^ Fedonkin, M. A. (1985). "Paleoichnology of Vendian Metazoa". In Sokolov, B. S.; Iwanowski, A. B. Vendian System: Historical–Geological and Paleontological Foundation, Vol. 1: Paleontology (in Russian). Moscow: Nauka. pp. 112–116. ^ Fedonkin, M. A. (1992). "Vendian faunas and the early evolution of Metazoa". In Lipps, J. H.; Signor, P. W. Origin and early evolution of the Metazoa. New: Plenum. pp. 87–129. ISBN 978-0-306-44067-0. Retrieved 2007-03-08. ^ Matz, V.; Frank, M.; Marshall, J.; Widder, A.; Johnsen, S. (Dec 2008). "Giant Deep-Sea Protist Produces Bilaterian-like Traces". Current Biology. 18 (23): 1849–1854. doi:10.1016/j.cub.2008.10.028. ISSN 0960-9822. PMID 19026540. ^ Seilacher, A.; Bose, P. K.; Pflüger, F. (1998-10-02). "Triploblastic Animals More Than 1 Billion Years Ago: Trace Fossil Evidence from India". Science. 282 (5386): 80–83. Bibcode:1998Sci...282...80S. doi:10.1126/science.282.5386.80. PMID 9756480. ^ Budd, G. E.; Jensen, S. (2000). "A critical reappraisal of the fossil record of the bilaterian phyla". Biological Reviews. 75 (2): 253–295. doi:10.1111/j.1469-185X.1999.tb00046.x. PMID 10881389. Retrieved 2007-06-27. ^ Ivantsov, A. Y.; Malakhovskaya, Y. E. (2002). "Giant Traces of Vendian Animals" (PDF). Doklady Earth Sciences (in Russian). 385 (6): 618–622. Archived from the original (PDF) on 2007-07-04. ^ A. Yu. Ivantsov. (2008). "Feeding traces of the Ediacaran animals". HPF-17 Trace fossils : ichnological concepts and methods. International Geological Congress – Oslo 2008. For a more cynical perspective see Butterfield, N. J. (Dec 2006). "Hooking some stem-group "worms": fossil lophotrochozoans in the Burgess Shale". BioEssays. 28 (12): 1161–1166. doi:10.1002/bies.20507. ISSN 0265-9247. PMID 17120226. ^ Glaessner, M. F. (1984). The Dawn of Animal Life: A Biohistorical Study. Cambridge University Press. ISBN 978-0-521-31216-5. OCLC 9394425. ^ REtallack, G.J. (2018). "Dickinsonia steroids not unique to animals". Science Eletter. 361: 1246. ^ Donovan, Stephen K.; Lewis, David N. (2001). "Fossils explained 35. The Ediacaran biota". Geology Today. 17 (3): 115–120. doi:10.1046/j.0266-6979.2001.00285.x. ^ Ford, T. D. (1958). "The Pre-cambrian fossils of Charnwood Forest". Proceedings of the Yorkshire Geological Society. 31 (3): 211–217. doi:10.1144/pygs.31.3.211. ^ Discussed at length in Laflamme, M.; Narbonne, G. M.; Anderson, M. M. (2004). "Morphometric analysis of the Ediacaran frond Charniodiscus from the Mistaken Point Formation, Newfoundland". Journal of Paleontology. 78 (5): 827–837. CiteSeerX 10.1.1.544.5084. doi:10.1666/0022-3360(2004)078<0827:MAOTEF>2.0.CO;2. ^ Williams, G.C. 1997. Preliminary assessment of the phylogenetics of pennatulacean octocorals, with a reevaluation of Ediacaran frond-like fossils, and a synthesis of the history of evolutionary thought regarding the sea pens. Proceedings of the Sixth International Conference of Coelenterate Biology: 497–509. ^ Antcliffe, J. B.; Brasier, M. D. (2007). "Charnia and sea pens are poles apart". Journal of the Geological Society. 164 (1): 49–51. doi:10.1144/0016-76492006-080. ^ Antcliffe, J. B.; Brasier, M. D. (2007). "Charnia At 50: Developmental Models For Ediacaran Fronds". Palaeontology. 51 (1): 11–26. doi:10.1111/j.1475-4983.2007.00738.x. ^ Seilacher, A.; Grazhdankin, D.; Legouta, A. (2003). "Ediacaran biota: The dawn of animal life in the shadow of giant protists". Paleontological Research. 7 (1): 43–54. doi:10.2517/prpsj.7.43. ^ Seilacher, A. (1984). "Late Precambrian and Early Cambrian Metazoa: preservational or real extinctions?". In Holland, H. D.; Trendall, A. F. Patterns of Change in Earth Evolution. Heidelberg: Springer-Verlag. pp. 159–168. ISBN 978-0-387-12749-1. OCLC 11202424. ^ Seilacher, A. (1989). "Vendozoa: organismic construction in the Proterozoic biosphere". Lethaia. 17 (3): 229–239. doi:10.1111/j.1502-3931.1989.tb01332.x. ^ Buss, L. W.; Seilacher, A. (1994). "The Phylum Vendobionta: A Sister Group of the Eumetazoa?". Paleobiology. 20 (1): 1–4. JSTOR 2401145. (Registration required (help)). ^ McMenamin, M. A. S. (1986). "The Garden of Ediacara". PALAIOS. 1 (2): 178–182. doi:10.2307/3514512. JSTOR 3514512. ^ a b Retallack, G.J. (2016). "Ediacaran fossils in thin section". Alcheringa. 40: 583–600. ^ Retallack, G. J. (1994). "Were the Ediacaran fossils lichens?" (PDF). Paleobiology. 20 (4): 523–544. Archived from the original (PDF) on 2009-02-25. Retrieved 2007-03-08. ^ a b c d Retallack, G. J. (2013). "Ediacaran life on land". Nature. 493 (7430): 89–92. Bibcode:2013Natur.493...89R. doi:10.1038/nature11777. PMID 23235827. ^ Waggoner, B. M. (1995). "Ediacaran Lichens: A Critique". Paleobiology. 21 (3): 393–397. JSTOR 2401174. (Registration required (help)). ^ Waggoner, B.; Collins, A. G. (2004). "Reductio Ad Absurdum: Testing The Evolutionary Relationships Of Ediacaran And Paleozoic Problematic Fossils Using Molecular Divergence Dates" (PDF). Journal of Paleontology. 78 (1): 51–61. doi:10.1666/0022-3360(2004)078<0051:RAATTE>2.0.CO;2. ^ Retallack, G. J. (2012). "Were Ediacaran siliciclastics of South Australia coastal or deep marine?". Sedimentology. 59 (4): 1208–1236. Bibcode:2012Sedim..59.1208R. doi:10.1111/j.1365-3091.2011.01302.x. ^ Waggoner, Ben (1998). "Interpreting the Earliest Metazoan Fossils: What Can We Learn?". Integrative and Comparative Biology. 38 (6): 975–982. doi:10.1093/icb/38.6.975. Archived from the original on 2012-12-21. Retrieved 2007-03-08. ^ Ford, T. D. (1958). "Pre-Cambrian fossils from Charnwood Forest". Proceedings of the Yorkshire Geological Society. 31 (6): 211–217. doi:10.1046/j.1365-2451.1999.00007.x. ^ Zhuralev (1992). Were Vend-Ediacaran multicellulars metazoa?. 29th International Geological Congress, Kyoto, Japan. 2. p. 339. ^ Peterson, K. J.; Waggoner B.; Hagadorn, J. W. (2003). "A Fungal Analog for Newfoundland Ediacaran Fossils?". Integrative and Comparative Biology. 43 (1): 127–136. doi:10.1093/icb/43.1.127. PMID 21680417. ^ Just, J.; Kristensen, R. M.; Olesen, J. (2014). "Dendrogramma, New Genus, with Two New Non-Bilaterian Species from the Marine Bathyal of Southeastern Australia (Animalia, Metazoa incertae sedis) – with Similarities to Some Medusoids from the Precambrian Ediacara". PLoS ONE. 9 (9): e102976. Bibcode:2014PLoSO...9j2976J. doi:10.1371/journal.pone.0102976. PMC 4153628. PMID 25184248. ^ Gough, Myles (7 June 2016). "Origin of mystery deep-sea mushroom revealed". BBC News. Retrieved 7 June 2016. ^ Schopf, J. W.; Packer, B. M. (1987-07-03). "Early Archean (3.3-billion to 3.5-billion-year-old) microfossils from Warrawoona Group, Australia". Science. 237 (4810): 70–3. Bibcode:1987Sci...237...70S. doi:10.1126/science.11539686. PMID 11539686. Retrieved 2007-05-21. ^ Archer, C.; Vance, D. (2006-03-01). "Coupled Fe and S isotope evidence for Archean microbial Fe (III) and sulfate reduction". Geology. 34 (3): 153–156. Bibcode:2006Geo....34..153A. doi:10.1130/G22067.1. ^ Fedonkin, M. A. (1980). "New representatives of the Precambrian coelenterates in the northern Russian platform". Paleontologicheskii Zhurnal (in Russian): 7–15. ISSN 0031-031X. ^ Meert, J. G.; Gibsher, A. S.; Levashova, N. M.; Grice, W. C.; Kamenov, G. D.; Rybanin, A. (2010). "Glaciation and ~770 Ma Ediacara (?) Fossils from the Lesser Karatau Microcontinent, Kazakhstan". Gondwana Research. 19 (4): 867–880. Bibcode:2011GondR..19..867M. doi:10.1016/j.gr.2010.11.008. ^ Canfield, D. E.; Teske, A. (Jul 1996). "Late Proterozoic rise in atmospheric oxygen concentration inferred from phylogenetic and sulphur-isotope studies". Nature. 382 (6587): 127–132. Bibcode:1996Natur.382..127C. doi:10.1038/382127a0. PMID 11536736. ^ Narbonne, Guy M. (September 2003). "Life after Snowball: The Mistaken Point biota and the origin of animal ecosystems". =Geological Society of America Abstracts with Programs. Seattle Annual Meeting of the GSA. 35. p. 516. Retrieved 2007-06-22. ^ Jensen, S. R.; Gehling, J. G.; Droser, M. L. (1998). "Ediacara-type fossils in Cambrian sediments". Nature. 393 (6685): 567–569. Bibcode:1998Natur.393..567J. doi:10.1038/31215. ^ Shu, D.-G; Morris, S. Conway; Han, J; Li, Y; Zhang, X.-L; Hua, H; Zhang, Z.-F; Liu, J.-N; Guo, J.-F; Yasui, K; Yao, Y (2006-05-05). "Lower Cambrian Vendobionts from China and Early Diploblast Evolution". Science. 312 (5774): 731–4. Bibcode:2006Sci...312..731S. doi:10.1126/science.1124565. PMID 16675697. ^ Dwarfed vendobionts from the Cambrian Kuanchuanpu Formation in South China. ^ Stanley, S. M. (1973). "An ecological theory for the sudden origin of multicellular life in the Late Precambrian". Proc. Natl. Acad. Sci. U.S.A. 70 (5): 1486–1489. Bibcode:1973PNAS...70.1486S. doi:10.1073/pnas.70.5.1486. PMC 433525. PMID 16592084. ^ Gould, S. J.; Calloway, C. B. (1980). "Clams and Brachiopods-Ships that Pass in the Night". Paleobiology. 6 (4): 383–396. JSTOR 2400538. ^ McKerrow, W. S.; Scotese, C. R.; Brasier, M. D. (1992). "Early Cambrian continental reconstructions". Journal of the Geological Society, London. 149 (4): 599–606. Bibcode:1992JGSoc.149..599M. doi:10.1144/gsjgs.149.4.0599. ^ Hallam, A. (1984). "Pre-Quaternary sea-level changes". Annual Review of Earth and Planetary Sciences. 12: 205–243. Bibcode:1984AREPS..12..205H. doi:10.1146/annurev.ea.12.050184.001225. ^ Brasier, M. D. (1992). "Background to the Cambrian explosion". Journal of the Geological Society, London. 149 (4): 585–587. Bibcode:1992JGSoc.149..585B. doi:10.1144/gsjgs.149.4.0585. ^ Brasier, M. D. (1992). "Global ocean-atmosphere change across the Precambrian-Cambrian transition". Geological Magazine. 129 (2): 161–168. Bibcode:1992GeoM..129..161B. doi:10.1017/S0016756800008256. ^ Bartley, J. K.; Pope, M.; Knoll, A. H.; Semikhatov, M. A.; Petrov, P. Y. U. (1998). "A Vendian-Cambrian boundary succession from the northwestern margin of the Siberian Platform: stratigraphy, palaeontology, chemostratigraphy and correlation". Geological Magazine. 135 (4): 473–494. Bibcode:1998JGSoc.155..957P. doi:10.1144/gsjgs.155.6.0957. PMID 11542817. ^ a b c Erwin, Douglas H. (May 2008). "Wonderful Ediacarans, Wonderful Cnidarians?". Evolution & Development. 10 (3): 263–264. doi:10.1111/j.1525-142X.2008.00234.x. PMID 18460087. ^ a b Retallack, G.J. (2016). "Ediacaran sedimentology and paleoecology of Newfoundland reconsidere". Sedimentary Geology. 333: 15–31. ^ Benus (May 1988). Trace fossils, small shelly fossils and the Precambrian-Cambrian boundary. New York State Museum Bulletin. 463. p. 81. ISBN 978-1-55557-178-8. ^ Clapham, Matthew E.; Narbonne, Guy M.; Gehling, James G. (2003). "Paleoecology of the oldest known animal communities: Ediacaran assemblages at Mistaken Point, Newfoundland". Paleobiology. 29 (4): 527–544. doi:10.1666/0094-8373(2003)029<0527:POTOKA>2.0.CO;2. ^ Clapham, M. E.; Narbonne, G. M. (2002). "Ediacaran epifaunal tiering". Geology. 30 (7): 627–630. Bibcode:2002Geo....30..627C. doi:10.1130/0091-7613(2002)030<0627:EET>2.0.CO;2. ^ Retallack, G.J. (2014). "Volcanosedimentary paleoenvironments of Ediacaran fossils in Newfoundlans". Geological Society of America Bulletin. 126: 619–648. ^ Retallack G. J. (2012). Criteria for distinguishing microbial mats and earths. Society of Economic Paleontologists and Mineralogists Special Paper. 101. Tulsa: Society of Economic Paleontologists and Mineralogists. pp. 136–152. ^ Narbonne, Guy M. (2005). "The Ediacara Biota: Neoproterozoic Origin of Animals and Their Ecosystems" (PDF). Annual Review of Earth and Planetary Sciences. 33: 421–442. Bibcode:2005AREPS..33..421N. doi:10.1146/annurev.earth.33.092203.122519. Archived from the original (PDF) on 2007-02-21. Retrieved 2009-01-03. ^ Schiffbauer, J.F. (2016). "The Latest Ediacaran Wormworld Fauna: Setting the Ecological Stage for the Cambrian Explosion". GSA Today. 26 (11): 4–11. ^ Waggoner, B. (1999). "Biogeographic Analyses of the Ediacara Biota: A Conflict with Paleotectonic Reconstructions". Paleobiology. 25 (4): 440–458. doi:10.1017/S0094837300020315. JSTOR 2666048. ^ Bambach, R. K.; Bush, A. M.; Erwin, D. H. (2007). "Autecology and the filling of Ecospace: Key metazoan radiations". Palæontology. 50 (1): 1–22. doi:10.1111/j.1475-4983.2006.00611.x. Mark McMenamin (1998). The Garden of Ediacara: Discovering the First Complex Life. New York: Columbia University Press. pp. 368pp. ISBN 978-0-231-10558-3. OCLC 3758852. A popular science account of these fossils, with a particular focus on the Namibian fossils. Derek Briggs; Peter Crowther, eds. (2001). Palæobiology II: A synthesis. Malden, MA: Blackwell Science. pp. Chapter 1. ISBN 978-0-632-05147-2. OCLC 43945263. Excellent further reading for the keen – includes many interesting chapters with macroevolutionary theme. Earth's oldest animal ecosystem held in fossils at Nilpena Station in SA outback ABC News, 5 August 2013. Accessed 6 August 2013. Meet the fossils ABC Landline TV program on Ediacaran fossils at Nilpena (audio + transcript). First broadcast 3 August 2013. Accessed 28 December 2018.